The Diamond Crown #5 Robusto is tagged with free shipping. If you order this product, your entire order will receive FREE BCP Ship Saver shipping! Diamond Crown cigars were first released in 1995 to celebrate the J.C. Newman Cigar Company’s 100th Anniversary. A bit ahead of their time, these legendary smokes were among the first to use a blend of 6-7 leaves, as well as the large 54 ring size in order to achieve maximum flavor output. The innovative efforts of Stanford Newman and Carlos Fuente Sr. Paid off, and before long the duo found themselves scrambling to keep up with increasingly high demand for this exciting new cigar. Over 20 years later, Diamond Crown cigars are still sweet, smooth, and rich like none other. Grab a batch and treat yourself to the original big-ring cigar that introduced a whole generation of cigar lovers to a new dimension of satisfying flavor. Diamond Crown #5 brings you smooth, woody, nutty, and creamy flavor in a 4 1/2 x 54 Short Robusto vitola. It's always a pleasure to smoke a Diamond Crown, don't care the size. No surprises except great consistency, flavor, and draw always. Try not to like them too much unless you have a great cigar budget. I honestly wish I did not enjoy these as much as I do due to the price; however, as a reward for good behavior you can't do much better for a mild/medium cigar. A fine smooth, mellow smoke- hints of wood & leather. 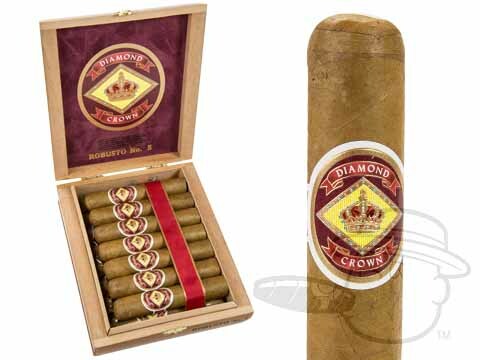 Diamond Crown #5 Robusto is rated 4.8 out of 5 based on 6 customer ratings.